Secretary of the Senate John Burch died suddenly. His wife and five children had expected him, at age fifty-four, to recover easily from a seemingly mild, but lingering illness. With the Senate out of session for the summer of 1881, he had the opportunity to relax and follow his doctor's orders. Saddened Senate officials and staff lost no time in arranging a meeting to plan suitable tributes. The Senate Enrolling Clerk convened the planning session and one of the Senate's legislative clerks acted as its secretary. To draft suitable resolutions, they appointed a committee composed of the Librarian of Congress, the Chief Reporter of Debates, and the Executive Clerk. The resulting resolutions, adopted unanimously, expressed "the affection entertained by the officers and employees for Colonel Burch because of his uniform courtesy, kindness and consideration: testifying to the faithfulness and ability with which he had performed the duties of his office, and indeed all the duties, public and private, of life." The meeting appointed pall bearers, including five senators, and resolved that the Sergeant at Arms would drape the Secretary's Office [Room S-224] in mourning for thirty days. A festive mood swept the Senate Democratic caucus on March 20, 1879, as members gathered to celebrate taking control of the Senate majority for the first time in eighteen years. None of the caucus's forty-three members in 1879 had been senators in 1859, the last time Democrats had organized the Senate. In the intervening years, the nation had suffered a disastrous civil war and a bitter reconstruction era. By 1879, Congress had readmitted all former Confederate states. Many observers speculated that the return of both houses of Congress to Democratic control marked the Confederacy's return to power. Democratic Caucus members happily turned to the election of new Senate officers, despite Republicans' futile protest that no vacancies existed. The outraged Republicans cited a Senate resolution, adopted thirty years earlier, that ended the earlier practice of voting on these officers at the beginning of every new Congress and allowed the Secretary and Sergeant at Arms to serve during good behavior. As far as Senate Republicans were concerned in 1879, the officers elected during the time they controlled the Senate had behaved themselves. "Not so!" responded the Democrats. Was not the incumbent Secretary, George Gorham, simultaneously serving as chairman of the Republican National Committee? How could this professional partisan fairly meet the needs of the opposition? The Senate Democratic Caucus moved ahead with its plans to elect a new Secretary and other officers. The Secretary's position attracted a great deal of interest among former members of Congress. The eight most visible candidates included a recently retired senator and four former House members. Maryland Senator George Dennis saw the Secretary's post as an ideal way to round out his long public career. Not everyone agreed, however. The New York Tribune, doing nothing to hide its Republican sympathies, reported that the Democratic senator had "put more vigor into his brief [campaign] for the position of Secretary than he had manifested during the six years of his Senatorial career, his record during that time being one continuous blank." Believing it inappropriate for a former senator to become a Senate officer, caucus members ignored Dennis' bid. They held no such reservations, however, against former House members. Among the former members, Tennessee Representative Harvey Watterson enjoyed the strongest support. Although Watterson had retired from Congress almost forty years earlier, he had subsequently become an influential figure in the national Democratic party and, for brief periods, editor of Democratic newspapers in Nashville and Washington. In seeking the Secretary's post, the sixty-seven-year-old editor had an effective campaign manager in his famous son, Henry Watterson, flamboyant editor of the Louisville Courier-Journal. When the Caucus voting began, Watterson led all other contenders, but failed to secure a majority. As weaker candidates fell away in successive balloting, it came down to a choice between two Tennessee Democratic editors -- Watterson and John C. Burch. On the fifth ballot, Burch won the post with twenty-four votes to Watterson's thirteen. By selecting John Burch, whom the Republicans respected for his fierce editorial opposition to the Ku Klux Klan, rather than the more deeply partisan Harvey Watterson, the Democrats took the sting out of Republican objections. Democrats then moved on to replace the incumbent Sergeant at Arms, Chief Clerk, Executive Clerk, and Chaplain. John Burch was born in 1827 in Jefferson County, Georgia. On graduating from Yale College in 1847, he returned to Georgia to study and practice law. In 1852, he moved to Chattanooga, Tennessee. Three years later he won election to the state house of representatives and, in 1857, to the state senate. As speaker of the senate, he earned a reputation for judiciousness and parliamentary skill. In those especially turbulent times, Burch was particularly proud of the fact that the senate found no cause to overturn any of his procedural rulings. In 1859, Burch became editor of the Nashville Union and American, Tennessee's most influential Democratic newspaper. At the start of the Civil War, he cast his lot with the Confederacy and served successively on the military staffs of Generals Gideon Pillow, Nathan Bedford Forrest, and Jones Withers. At war's end, he resumed his Nashville law practice and, in 1869, purchased a controlling interest in the Union and American. Burch served subsequently as that paper's editor, business manager, and chief writer. 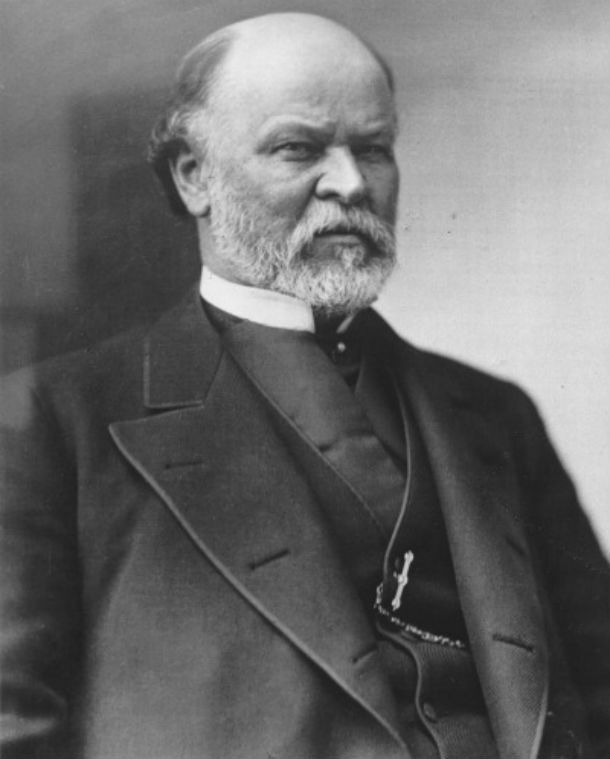 In 1873, he became his state's comptroller, whose "onerous duties [he] discharged with great ability, rigid integrity and perfect justice and impartiality." Burch's parliamentary, administrative, and financial experience made him an ideal candidate to become the United States Senate's Secretary. Within days of Burch's election, Senate Democrats introduced a resolution returning to the Secretary and Sergeant at Arms exclusive authority to appoint and remove their staffs. For the past twenty-five years, the Senate had assigned to the Vice President power to override all such personnel actions. But in 1879, for the first time since the 1854 adoption of that standing order, the Vice President was not a member of the party that controlled the Senate majority. This change greatly irritated Republican leaders. Rhode Island's Henry Anthony charged that the Democratic Caucus was now unfairly dictating the Senate's agenda and that the introduction of this resolution served as a good example of the Democratic "Juggernaut which rolls through the Senate, crushing out our venerable precedents, trampling upon our ancient usages, and breaking in upon the freedom of our discussions." Democratic Senator George Pendleton, soon to become the father of the federal civil service system, responded that while an officer might faithfully discharge his duties, he could nevertheless, "by reason of his manner, be disagreeable to senators and therefore not a fit person to discharge acceptably the duties of the office." So long as Senate officers were responsible to members, Pendleton believed those officers should have authority to hire and fire staff without having to answer to an official "who, however high he may be in the Government, is not a Senator upon this floor and is not charged with the duties of a Senator." In adopting the resolution, the Senate gave Burch a degree of authority greater than that exercised by his six predecessors. Burch proved to be a highly competent and universally respected Secretary. Members demonstrated that respect in March 1881, when the Senate found itself equally divided between Republicans and Democrats, by agreeing to keep him in office. Unfortunately, Burch had little time to develop a lasting record of accomplishments. His death on July 28, 1881, assigned him the undesired distinction of being the Senate's shortest-serving Secretary to that time. His demise raised immediate concerns about disbursement of Senate funds, as no provision existed for any other official to assume the Secretary's financial responsibilities. Twenty years earlier, in 1861, the Senate had provided for the chief clerk to assume this role during the then-Secretary's illness. When the Senate convened in October 1881, it resolved the issue by appointing Chief Clerk Francis Shober as acting Secretary. Shober served effectively in that capacity until the Republicans regained control in March 1883. On that occasion, it became the Democrats' turn to raise arguments about the importance of continuity among the Senate's key officials. Republicans smiled and held their elections.